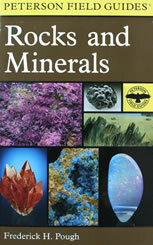 An introduction to rocks and minerals with detailed photos, description and identification information. Sponsored by the National Audubon Society, the National Wildlife Federation, and the Roger Tory Peterson Institute. This book is a 4 1/2" x 7 1/4" paperback with 401 pages.